Ok, I know this is my third braised eggplant post in almost as many months. What can I say? I absolutely love eggplant cooked this way, and I am on a mission to convert all of you eggplant haters. It's relatively quick and definitely easy, and it absolutely melts in your mouth. I made creme fraiche the week before the holidays, but never made the dish with which I had intended to use it and I didn't know what else to do with it so I looked online and found that you can freeze it. So I divided it into a few small jars and threw them into the freezer before heading down to Austin. And promptly forgot that they were in there. Until the happy night that I decided to braise this eggplant and was rummaging around the kitchen to find enough liquids to make the sauce. I didn't have much on hand and I did not want to defrost an entire jar of vegetable broth just to use the small amount I needed. But I did have an orange, and I finally remembered that I had the creme fraiche. I knew I was onto something good. I use oranges a lot in my stir fries. It usually makes the sauce sweet enough that it can replace any sugar. I based this sauce on a similar principle - orange juice, soy sauce and sherry. When the eggplant was done and removed it from the pan, cooked down the sauce, and added the creme fraiche just before removing the pan from the heat. 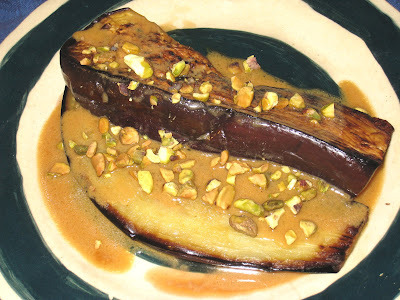 I spooned it over the eggplant, then topped them with toasted chopped pistachios. De-licious! A word about the frozen creme fraiche - it gets grainy when you defrost it, so you can't use it straight from the bowl. But it works beautifully in sauces.